The Edible Schoolyard Berkeley (ESY Berkeley) is a one-acre organic garden and kitchen classroom for urban public school students at Martin Luther King, Jr. Middle School. This model program for edible education is fully funded by the Edible Schoolyard Project. At ESY Berkeley, students participate in all aspects of growing, harvesting, and preparing nutritious, seasonal produce during the academic day and in after-school classes. 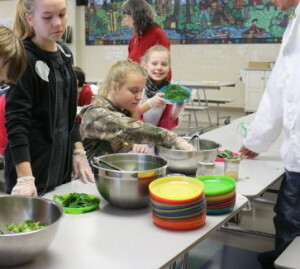 Students’ hands-on experience in the kitchen and garden fosters a deeper appreciation of how the natural world sustains us and promotes the environmental and social well-being of our school community. The Edible Schoolyard program is fully integrated into the fabric of the school. Lessons in the kitchen and garden classrooms bring academic subjects to life and cultivate an appetite for fresh, healthy food, as well as the confidence to prepare it at home. North Shore Community School received a grant to send three staff members to the ESY in the summer of 2015. Staff and students have begun to implement this curriculum, and our new geothermal greenhouse has been overflowing with growth! Through charitable companies like The Whole Kids Foundation and Voya Financial (Unsung Heroes) we have obtained monies to fund two portable kitchen carts and tools and supplies for the greenhouse.